We are an evolution of the dental industry in a time where forward-thinking vision is needed. As a progressive group, we believe we understand the opportunity that has emerged through the evolution of the dental industry. In 2016, Dr. Mark Dake, Merritt Dake and Dr. Bryan Hiller joined forces to revolutionize what dental professionals have been striving for collectively for years: growth while providing some of the highest quality patient care possible. Rock Dental Brands is the result of dentists, dental specialists, and business professionals collaborating to improve the quality of patient care while eliminating the challenges in the day-to-day operation of private practice. The principles of economies of scale and strength in numbers have helped Rock Dental Brands achieve great success. Our group provides the services that allow our doctors to practice exceptional general and specialty dentistry in state-of-the-art offices using the most up-to-date dental equipment and technology. Today, we are a practice management group that provides support to the general dentists and dental specialists in our affiliates: Leap Kids Pediatric Dentistry, Westrock Orthodontics, Rock Family Dental and Impact Oral Surgery. We are dedicated to supporting these doctors so they can strive to set the highest standard of care possible throughout the lifetime of their patients. These doctors are able to focus solely on providing high-quality, patient-centric care through collaboration, quality assurance programs, continued research and educational development, and exceptional performance. Over time, the Rock Dental Brands affiliates have established a culture that puts patients first. Rock Dental Brands does not require daily production numbers, nor do we influence treatment plans. We recognize that the doctor is the expert when it comes to the patient, and that is why doctors dictate the best treatment for their patients. As doctors are the dental experts, we recognize that a truly successful practice needs experts in the specialty of business as well. Our business specialists work to improve the efficiency of practice operations through streamlined inventory and purchasing, efficient human resource management, targeted marketing, IT expertise, laboratory and appliance manufacturing, as well as comprehensive office design, construction and property and equipment maintenance. We have designed a comprehensive Quality Assurance Program that closely mirrors the United States Air Force, Dental Corps Quality Assurance Program. This program helps address areas in need of improvement, and then highlight those of exceptional performance through Peer Review, Continuing Education, Credentialing and the support of a Dental Executive Committee. The Rock Dental Brands Home Office Team is made up of business specialists that thrive to execute the tasks that make them tick: multi-level review, research and development, establishing tracking metrics, analytics and forecasting, and much more. These teams are responsible for providing the business management services necessary for the doctors to keep their minds on the practice of exceptional dentistry and maintaining the highest quality of patient care possible. Supporting the practices is the foundation of Rock Dental Brands. This alone sets us apart from corporate and private practices alike. Rock Dental Brands supports the affiliate general and specialty practices to enhance the quality of care that one doctor may provide. The doctors assist each other with difficult cases and provide a network of general dentists and dental specialists available for consultation and advice. What we are advocating is true multidisciplinary care; doctor ego, practice competition, and economic pressures are eliminated in this type of partnership, leaving patient care as the primary focus. The net result is strengthened provider and team relationships and most importantly, better patient care. We challenge you to find this anywhere else. "...a great team of administrative support staff." One of the best things about being a part of this group is the convenience of having a great team of administrative support staff. That allows me to dedicate almost all of my time at work to treating patients. Treatment through all stages of life. Rock Dental Brands has four unique affiliates that are each founded with quality care in mind: Leap Kids Pediatric Dental, Westrock Orthodontics, Rock Family Dental, and Impact Oral Surgery. High-end, trustworthy, and reliable dental offices. At Rock Family Dental, our goal is to make quality care attainable for each and every patient throughout their lifetime. 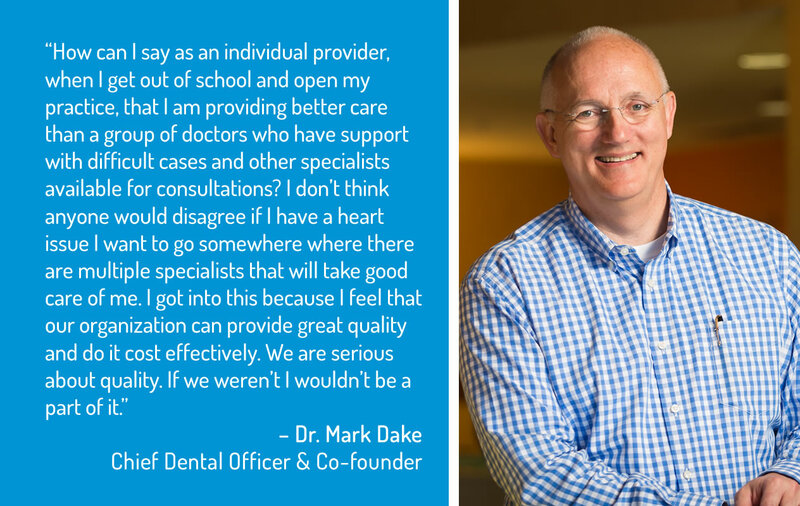 As a group of dentists, who share a common vision for the future of dental care, we understand the importance of providing a dental home to our patients. In order to improve oral and overall health, we consistently focus on the relationship with each patient and strive to better our patients’ experiences. Being linked to a group of specialists, who provide multidisciplinary care in Pediatric Dentistry, Orthodontics and Oral Surgery, creates a greater opportunity for collaborative and thorough diagnosis, treatment planning, and ongoing treatment. We consider it a privilege to treat your children. Leap Kids Pediatric Dental started in 2015 with a group of pediatric dentists and general dentists who joined together in the development of a group of high-end, trustworthy, reliable pediatric dental offices for infants, children and adolescents. The doctors and staff use a multitude of experiences and treatment cases to learn best practices and are able to share their education with each other in order to offer comprehensive, advanced care founded on AAPD accepted clinical guidelines. Leap Kids Pediatric Dental has gone above and beyond to develop an in-depth peer review program to ensure that the highest quality of care is provided in all of our clinics. Achieving the best results through quality patient care. In 2015, the Westrock Orthodontics brand was created, paying homage to the two locations where this concept began: West Plains, MO and Little Rock, AR. At Westrock Orthodontics, we are a group of private practitioners that have banded together to provide high quality care possible through the sharing of ideas, techniques, management skills and taking advantage of doctor-to-doctor consultation. We strive to achieve excellent finishes on every smile so that our results could be presented for critique by our peers – this is an internal drive, a personal integrity and a part of our culture to give every patient the best smile and bite that is possible. Creating the best treatment plan possible for patients. At Impact, the specialists are highly skilled oral surgeons who provide the same high-quality care that can be found in large hospitals. Through the peer review, collaboration and quality assurance processes put in place through the affiliates of Rock Dental Brands, the patients are confident that treatment is being provided by experienced and qualified professionals.